What About That Website Disaster? 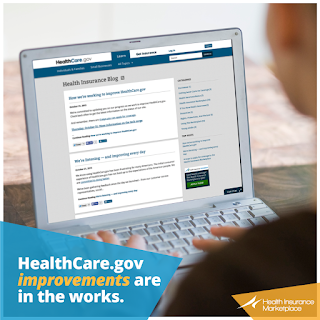 I would be remiss to not take an condensed look at the disastrous inauguration of the Obamacare website Launched at 12:00 AM October 1, 2013 in Washington, DC. [i] What in the world went so wrong? Rule number one for a muhurta is "Initiate important programs during daylight hours." If you must start at night, choose a night with a bright Moon. The website was launched at midnight in the 12th tithi of a waning Moon (three days before a new Moon). This was a very bad choice of time. 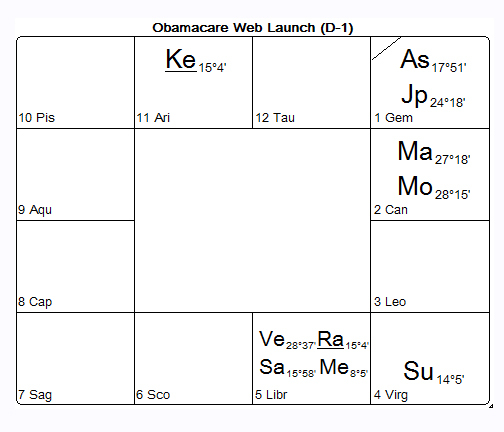 The five balam relationships with President Obama's natal chart were mixed (three strongly supportive , two unsupportive). They point to the ability to produce success but only after troubled waters are navigated. 1st lord Mercury is tenanted in the friendly 5th house, sign of Libra in the star of Swati. He is associated with NB Venus, NM Saturn and NM Rahu. He is aspected by NB Jupiter NM Mars. This results in Mercury's mixed condition of two STS and three STW (see Exhibit 2 at bottom for Planetary Strengths definitions). Parvata yoga[ii] is created by1st lord Mercury's dispositor Venus placement in its own sign in a trine house. NB Jupiter's placement in the 1st house combined with his aspect of and NB Venus association with 1st lord Mercury creates a Chamara yoga. These yogas suggests a very strong 1st house and lord which will improve with age. Saturn, Venus and Jupiter are all strongly conditioned. Saturn is exalted (FTS), Venus is in its own sign (FTS) and Jupiter has directional strength (FTS). This enhances their involvement in the above and below mentioned yogas. There are six Dharma-Karma Adhipati yogas involving 1st and 4th lord Mercury, 9th lord Saturn and 5th lord Venus that ultimately assure success for the web site. Mercury, Venus and Jupiter form a beautiful Saraswati yoga signifying a foremost strength in communications and eloquence. Venus and Saturn form a powerful Lakshmi yoga[iii] (bestows financial success, provides protection of the people). 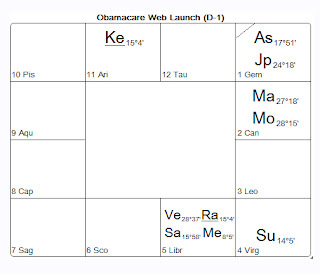 Just like Obamacare, the Ascendant resides in the star of Ardra. This greatly bolsters the promises of the earlier described Ardra troubles, followed by a constant drive for improvement. For the first two years the website is in the dasha of 1st lord Mercury who is in the star of Swati. This means that the Swati characteristics will be prevalent during those years. Swati is symbolized by a young sprout wavering in the wind. It does not yet have the strength to stand tall and straight on its own. It’s deity is Vayu (the wind). Swati natives are plagued with indecisiveness and challenges to their survival. They strive for growth and independence while remaining fragile to the elements. They play the role of a unifier and/or segregator and are often involved in the founding of new institutions. 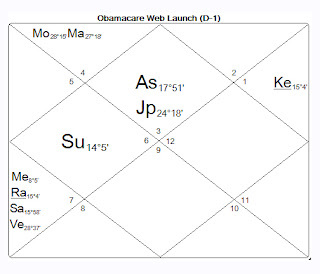 During the abbreviated two year Mercury dasha, the web site will be in Saturn bhukti. Exalted Saturn (FTS) shares a mutual side aspect relationship with debilitated Mars (FTW). Both of these NM planets are in an exaggerated condition. This will overstate the inherent anxiety formed from the mixture of hot, fast moving Mars against cold, slow Saturn. They both are influencing the 1st lord Mercury. This anxiety is destined to be strongly expressed during the Mercury dasha Saturn bhukti. Saturn also occupies the star Swati in the exact same degree as Rahu. This close relationship foretells great unplanned upheaval. Rahu magnifies both Saturn and Mercury’s Swati nature and the effects of the Mars Saturn shared side aspects. This has the outcome of Swati on steroids for the first two years. Instead of a mild wind, think of a hurricane ... with lots of lightening! Ultimately, the yogic 1st lord Mercury and 1st house will deliver their positive promises during the Mercury dasha. It appears that after the massive failures of introduction, the full force of the government has already transformed the web site into a well-written tool. 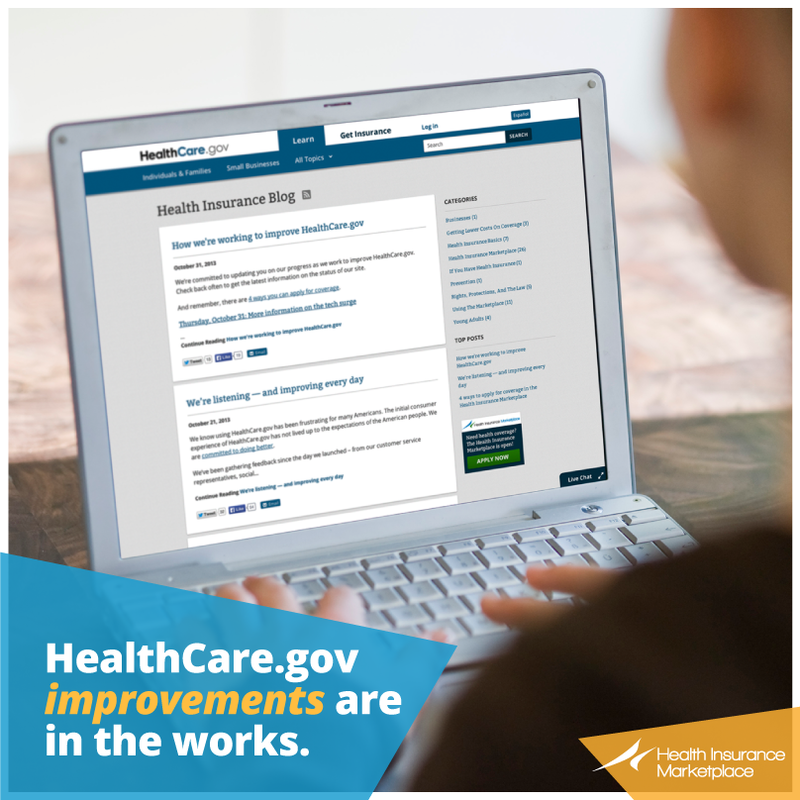 It is reasonable to expect the website to continue to improve. It might even attain nice artwork and music on it (due to the Saraswati yoga).